Home / Lil Wayne / Young Money / . @LilTunechi w/ SPECIAL GUESTS PERFORMS LIVE ON THE 2017 #SXSW TAKEOVER STAGE!
. @LilTunechi w/ SPECIAL GUESTS PERFORMS LIVE ON THE 2017 #SXSW TAKEOVER STAGE! Since 2008, DNES Marketing’s SXSW Takeover has created a platform that brings the biggest and best hip hop artists to Austin for SXSW. 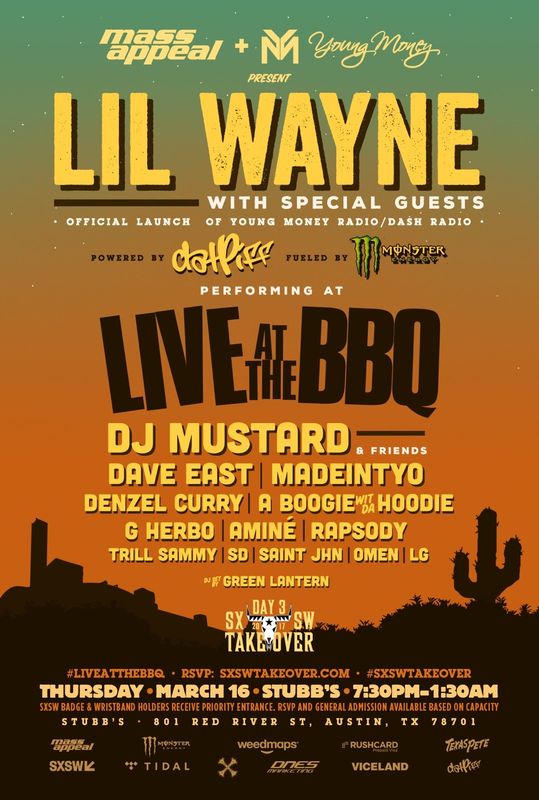 This year is no different as SXSW Takeover welcomes Lil Wayne with Special Guests on Thursday, March 16th to perform Live At The BBQ at Stubbs (801 Red River St, Austin, TX 78701). Doors open at 7PM and close at 1:30AM. Sponsored by Mass Appeal, Viceland, Datpiff, Weedmaps, Rush Card, Texas Pete and Monster, in addition to Lil Wayne, the line up for night three of the SXSW Takeover includes: DJ Mustard & Friends, Dave East, MADEINTYO, Denzel Curry, A Boogie with a Hoodie, G Herbo, Amine', Rapsody, Trill Sammy, SD, Saint JHN, LG and Omen. DJ Green Lantern is the official DJ for the night. Lil Wayne will officially launch his new radio channel, Young Money Radio distributed by Dash Radio, on site at the Viceland footprint on the SXSW Takeover grounds. Over the past eight years, SXSW Takeover has created some of the most memorable hip hop events at SXSW. Showcasing some of today's hottest stars J-Cole, Eminem, 50 Cent, Erykah Badu, Kendrick Lamar, Wiz Khalifa, Mac Miller, G-Eazy, Nas, Wale, Khelani, Wu Tang Clan and many many more. This year's 2017 lineup does not disappoint with exclusive all star cast Lil Wayne, Gucci Mane, Lil Uzi Vert, Joey Badass and many more!